Late on Saturday evening, I drove around to a parking space on the edge of Barton Farm. As I pulled up a dog walker putting her pet back in the car seemed to be lingering, waiting to see what dog I had. She gave me a rather disdainful look as I lifted the hatch and rear shelf of our rather shabby motor. What sort of man would make his dog travel cramped up in the dark boot of his car? She looked somewhat surprised when the only the only things I had to get out were my Wellington boots and camera bag. "Oh, I thought you had a dog in there!" "No, not me," I replied. "I've come to take some photographs before the light fades." We exchanged pleasantries about the fine weather as I pulled on my boots and locked up the car. "Are you a professional?" she asked, and I explained that no, I was here for my own pleasure. I knew what she was going to say next would raise my hackles. "Oh, so just a hobby." To say that I was an artist hoping to make some observations about the farm as as it gets developed in to a housing estate would be overblown and pretentious. To say that photography gives me a thrill when I can make a visual and metaphorical link between a subject and its environment is a bit weird and strong for most people. However, both statements are nearer the mark than saying photography is a pastime, something to gently fritter away precious hours of free time. I have to make time, clear other duties, prioritise and justify to be able to go out and make pictures that only a handful of people will see, because I need that creative space. But it's too difficult to explain that to others who don't know or appreciate art. The sun was setting fast; I needed to get a move on. I know I’m not really giving anyone enough notice, but if you are in the Southampton area this weekend or next you must go down to the City Art Gallery to catch Kurt Jackson’s wonderful ‘Place’ exhibition before it packs up and heads to the West Country for a long stint in Truro and then onto Bath in October. The last Jackson exhibition I saw was The Thames Revisited where Jackson followed the path of the River Thames, and the progression of landscapes it moves through. This exhibition finds him travelling all over the country visiting the favourite locales of selected guests. These include writers, poets, musicians, environmentalists and friends. Each of the guests has written describing their feelings about the places, the texts placed alongside Jackson’s creations. The display ranges from tiny playing-card sized paintings through to his enormous canvases. There are beautiful cast sculptures, a wire and junk mesh (from Glastonbury), beach-combed shells and bones from the Scottish coast. My favourite piece called Erme, Dusk was a small collection of driftwood with a painted coastal scene, complete with found pebbles, a bleached stick and a plastic fork. At the other end of the scale, his huge paintings of the Broomway on the Essex coast really conveyed the enormity of the Essex coastal mudflats and sky. But I liked almost everything in this exciting show. There is a very nice book to accompany the show that is now my bedtime reading, however the work really deserves to be seen in the flesh to appreciate the physicality of the paint textures, the three dimensional collaging added to some of the pictures and the hugeness of his largest canvases. Seems I'm going to be making another trip down there this weekend. For years there have been discussions, protests, public meetings and local news articles about the fate of Barton Farm, the first area of green space north of Winchester. But it's a done deal now. The approvals have been given, the diggers have arrived and the ground has been cut. Over the next few years, this unremarkable but cherished area will turn into a new housing estate with over 2500 homes. The plans have been made, the first stakes in the ground have been placed. Topsoil in which crops once grew has now been removed, presumably for purposes of landscaping. Will this project provide rich profits for the developers selling housing at a premium and over burdening the city's infrastructure, or will it provide affordable housing and give stability to the city centre and its key services like the hospital? I don't know but I hope it's the latter. Let's hope that the name stays as Barton Farm to remember what was here, rather than giving some stupid name such as Cameron Fields or Thatcher Heights. That wouldn't surprise me. When working with materials artists routinely experiment to find interesting and inspiring textures, patterns and shapes. With photos, we can keep an eye open for similar experiments that have occurred by nature or wear. This is a picture of corrugated sheet found on the side of a compost heap up at the allotment. Something has made the paint craze and shrink, revealing the zinc plating below, but it is hard to imagine just what the mechanism was to create such nice soft ellipses. We don't get much snow down these parts. I think that in the thirty years that I've lived in Winchester we have only had about five significant falls of snow in which the snow lasted for more than two days. This, of course, is hardly surprising given our location. However, we do get frosts and once or twice each winter and if we are lucky we get to see good hoar frost. Such a frost occurred just before New Year. With a spare hour before the arrival of friends, I took off to our nearby allotment to see if I could make some worthwhile pictures. I have been photographing allotments for many years now and find them endlessly interesting. There is always the juxtaposition of growth and decay, built and natural, creation and abandon that is interesting in its own right, or as metaphors for other concerns. As photographers we are able to find a wide palette of colours and textures, and a myriad of small details that can be contrasted with the larger environment. The flat soft light of winter can be very appealing, but I find that a small additional amount of lighting really helps to lift the picture, so in these conditions I often use fill-flash. Our eyes and minds see and interpret all the interesting details in front of us, balancing and emphasising in many different ways. Our cameras, on the other hand, are dispassionate and so render the scene without interpretation. I feel it is our purpose as photographers to modify the image on a way that helps guide the viewer, and so I enjoy using the flash to help build the image. The trick, of course, is to make the image both special and believable. Here is a small ‘dekkergraph’ made last month at Barton Farm. My previous post about Ger Dekkers has proven to be one of my most viewed pages, which says more about the lack of information online about the artist than it does about the blog. There was a recent post on the Socks Studio blog which has some interesting image series to examine. 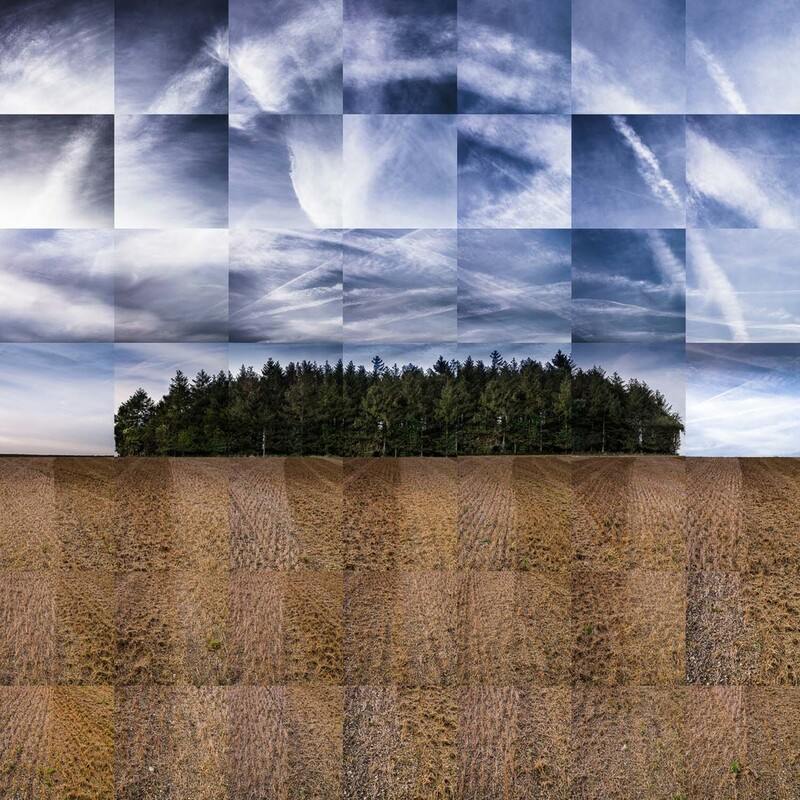 All of Dekkers’ series are of the large scale landscape; clean open vistas of fields or regularly planted stands of trees and woods, where the geometry of man-made lines or curves are exploited to create the design of the series and the interlinking of adjacent pictures. In my experience, spotting suitable locations that are suitable for ‘dekkergraphs’ is difficult enough in the first place. Then the series of images need to be rigorously executed to ensure that the series works cohesively. To do this successfully requires careful thought, planning and a fair amount of walking. Perhaps it is not surprising that few people have followed this branch of photographic technique. In Dekkers’ homeland of the Netherlands such scenes might well be common, but in the cluttered, rural areas of Hampshire such opportunities are hard to find. Last month I was up at Barton Farm attempting to make a joiner of the newly harvested fields. As the harvesting was only partially complete, the fields were especially interesting, with plenty of close shaven stubble, long mounds of cut straw, and stiff upright stalks of barley with soft heads bowing under their own weight. I came across this acute corner of remaining barley which I wanted to photograph, but knew that it would not work with any of the other pictures that I had taken for a larger joiner of the field. It occurred to me that this might be worth an experiment as Ger Dekkers-style sequence. Unlike Dekkers’ pictures, the subject of this sequence was close to the camera. This meant that instead of walking in a straight line I would need to walk in an arc, maintaining my distance from the corner of the barley cutting. Care was taken to ensure key points in the geometry of the images remained aligned from frame to frame. It’s not the most complex or challenging of pictures, but the sequence seems to work well enough and hopefully is a stepping stone to some new work. In July we took a trip into rural Essex to watch the Tour de France ride past on the stage from Cambridge to London. It was a good mini-adventure; B&B at a nice farm, a good curry the night before and a lovely bike ride through the countryside to the village of Felstead which was in party mode for the day. Standing at the corner of the road (always a good place to watch) and opposite the pub, there was a lot of funny banter as we waited for a couple of hours until the peleton flashed by. But unfortunately, there wasn’t a lot of cycling to be seen. The main pack shot past in a matter of seconds, the stragglers delayed by mechanical, food or ‘comfort’ reasons in the next minute. Then it was all over and time to go home after a walk around the village and a spot of lunch. A much better way of getting close to the action of a bike race is to watch a criterium race. This is where a kilometre or so of a town centre is cordoned off and cyclists hare around the twisty narrow lanes for about 100 laps. The event is free and spectators can wander around behind the barricades to find different vantage points. My home town of Winchester hosted such a race last Sunday; I happened across the event only by chance when travelling out of the town earlier in the day. On our return, I stopped off in time to see the final race of the day, the men’s elite race. All I had with me was the G3 with the standard 20mm lens, so the only way to take pictures was to get in close, something that is pretty easy to do at a criterium as the riders come perilously close to the barriers. It is also easy to find a good spot to take pictures as the there are many sharp corners and the crowd is spread thinly all around the course apart from the premium position at the finish line. Barton Farm, on Winchester's northern boundary will soon no longer yield to the plough. It will bend instead to the bulldozer as 2000 new homes are built over its rolling fields. Such large scale development will always be controversial, and one cannot but feel sad for the loss of more open space especially when it is on one's doorstep. Progress or profiteering? Let's hope it’s the former. If there is one thing a photographer has to do it is to record; people, places and things, because they and their context will change will change. Last summer I rode up to the farm to photograph what I thought would be the last fields full of corn and barley. But I had left it too late, only to find neat rows of stubble, corn dust in the air and the combine harvester cutting its way through the last few rows of corn. I felt quite bereft at having missed the opportunity. Most of us locals believed that the construction work would start early this year. For whatever reason, the Farm was given a reprise, or a stay of execution, for another year and the fields have had corn in them again this summer. The wheat is already in, but the fields I wanted to photograph have barley which is still standing for a few more days. Over the past week I have cycled over to the farm to take pictures, and get enough material to create a new joiner. I have yet to build that joiner, but at least I have a record of how Barton Farm looked before its last harvest. We have an allotment and it is a constant fascination to visit the site to see how everyone's endeavours are flourishing. When the horticultural tasks are finished on our plot I wander around with the camera. The place is ripe with beautiful produce, and it is my task to produce something beautiful with the camera. We used to visit the farm four or five times a year in the eighties and nineties, so it was good to visit again last weekend. These are a couple of shots from a flying visit. There is a certain type of landscape photography that is a kind of geographic or natural history big-game hunting. Super-keen photographers will travel large distances, arrange special holidays and camp out at these beauty locations in search of the perfect lighting and weather conditions to produce a photograph that is complete facsimile of the same view seen many times over in magazines, competitions and lectures. I don’t know how many times I’ve seen pictures of Glen Etive Moor, Malham Tarn, the boat huts at Lindisfarne and arch at Durdle Door. I’ve met some guys who make a profession of photographing these clichés and taking groups of keen hobbyists on workshops to reproduce yet more versions of these places. Our local honeypot is the rather mundane Micheldever Woods. For most of the year it is unremarkable small woodland that has the M3 running noisily past it. However, for a few glorious weeks at the end of April and the beginning of May it is the place to go to photograph bluebells. I’ve known people travel for a couple of hours in the night to be here just as the sun rises to capture that perfect rendition of a bluey-purple carpet of flowers. A friend once relayed how on one occasion a dozen or so other photographers had set up a line of cameras on tripods on either side of him so that they too might capture an original picture. There have been times too when we’ve travelled up there for a springtime exam stress-busting walk only to find choked car parks and strings of abandoned cars along the road through the woods. We travelled up to Micheldever Woods late on Saturday afternoon for stroll amongst the tall trees and the dusty bluebells. The display in the main wood was less impressive than it had been in most of the previous years that we’ve visited this spot. I don’t know what the reasons were; apart from a sizeable number of fallen trees little looked different. But we had spied another section very close to the motorway on our way in and decided to visit this place. In here was the densest covering that I’ve ever seen. The scent was heady and the colours, even at the end of the day, intense. After a short walk my wife suggested that I come back first thing in the morning to take some pictures by myself. I don’t sleep so well these days, and so at 5:30 the next morning I found myself awake and in need of stretching my legs. I parked the car just after six and entered the newly discovered woodland, which was just beginning to catch the first rays of morning light. The protocol is to find your pitch, set up the camera and tripod and then repeatedly take pictures of the scene as the light changes. I can’t work this way; all of my shots are hand held, up close and often from a low vantage point. I’ll stick the flash on if it is too dark or the contrast is working against me, but almost never use a tripod. I need to move around, try new ideas, work the subject and finesse the picture. Maybe that’s why so many of my pictures rubbish. Anyway, I wandered off to a quiet corner of the woods and had a very pleasant hour making pictures while the sun came up. One thing that was apparent was just how many bluebells had been trampled by previous visitors. It was sadly clear that the flattened flowers were the result of photographers trying to get in close or get a good vantage point. The paths made only went as far as these photo-opportunities. I’m afraid that this is a continual problem for attractive places be it bluebell woods or historic sites. In our eagerness to see these places, our presence makes them less attractive for everyone else. Fortunately there are several other woods in my area that, while less extensive than Micheldever, are prettier and more intimate. I’ll be visiting those places over the couple weeks, and hopefully I will be able to keep them secret. It was good to get an email the other day from my friend Noel Myles, letting me know that he had updated his website. The new website is unusual; instead of being presented with conventional gallery based sites you are immediately taken to an e-book that is an online portfolio of his work from 1986 to 2013. It's a nice take on the old concept of the photographer's 'book' and a compelling and rewarding way to look at his work. Back in the day, before we had websites, tweets, Facebook, blogs and Instagram, every serious photographer who was seriously looking for commissions had their 'book', a beautifully put together portfolio. Often leather bound and handmade, these books were exquisite, expensive collections of prints that were necessary to show one's work to best advantage. Noel's online book feels like a very modern take on the old concept. There is work on display that I have not seen before, and as ever, his work is fresh, unique and fascinating. In a world that is awash with dull, uncrafted conceptual art photography, Noel’s pictures are always interesting and rewarding. It is difficult to lose yourself in a photo in the same way as you do with a painting and we have become accustomed to viewing photos with fleeting glances, but Noel’s Still Films grab your attention and demand a longer look. Go have a look; you can even print a paper copy for yourself. It certainly feels that way sometimes, and the latter half of 2013 was more bitter than sweet for many I knew; family, friends, colleagues and myself. During the latter half of the year I’ve hardly picked up the camera at all. It all started with self-destruction of the Arena group of which I was a member. Since then circumstances and disillusionment have blunted my opportunities and enthusiasm to work on and enjoy my picture making, which has meant no new blog posts since October. Anyway, 2014 is ahead of us now and the New Year is always a good opportunity to look ahead positively. Happy New Year! Another recent picture from Crabwood. Autumn is not very advanced and there are plenty of trees still in green leaf at the moment. It’s strange, the more I visit this place the more I find to photograph. Crabwood and the allotments are my two default locations to visit when I feel the need to photograph but have no specifics in mind. The Guardian ran a small article today about the BBC presenter and commentator Andrew Marr. Rather than focus on his professional knowledge, this piece concerned his new book about his amateur passion, his joy of drawing, or sketching. The basic premise was that it is better to be doing something creative with one’s hands than it is to sit transfixed to a screen, be that a television, computer or tablet. I couldn’t agree more. From necessity, I spend more hours in front of a computer monitor than I do anything else. I spend less time asleep than I do handling and writing emails, preparing spreadsheets or working on some web tool to carry out my daily fare of work tasks. The last thing I want to do when I have some free time is to sit in front of another glowing screen for my entertainment. To spend one’s evening passively being entertained seems to be an opportunity lost to do something worthwhile. I used to carry a small netbook with me on my daily commute on the train, when I would write my blog posts, social emails or view my favourite blogs and websites. These days, I prefer to read books (on paper – not kindle!) or make the most of the view before we slip into the darkness of winter. On some journeys I will just take time off to think and dream, on others I will listen to one of the many spoken voice podcasts to which I subscribe (you must search out Radiolab if you have yet to hear it). On normal working days I rarely do any photo editing in the evening because of screen fatigue. Maybe one day we will have monitors that look like the paintings in Harry Potter, but until then I will guard against screen burn. To go out with the camera is a different thing altogether, thank goodness. Although the cameras are now digital and the viewfinders are yet another splurge of illuminated pixels, it feels invigorating to be moving about, setting the camera and capturing the image. Of all the time spent looking, very little of it is through the viewfinder. Most of the time I am hunting down a telling icon or motif, searching out a viewpoint and composition, thinking about the lighting to tell the story. I almost never use a tripod, and I am often on my knees bending down to get low shots or interesting angles. I find it very absorbing and relaxing, therapeutic even, to be out making images. So it was yesterday, on a visit with my son to Crabwood. I normally prefer to photograph by myself, but he is patient, inquisitive and good company. We explored and talked while I looked for pictures, coming away with a clutch of pictures, memories of a gorgeous autumnal morning, and the satisfaction of time well spent. One of my New Year’s resolutions was to write a post at least once a week and preferably twice, on the premise that little and often is better than big and infrequent, especially if big does not mean better. Obviously I have failed in the quest, as it is more than a month since the last post. I could have written so much, but life has been too busy in the past few weeks to give me much time to record it. And I’ve been so tired during the recent heatwave. Normally I write my posts on the train on my way to and from work, but I’ve been too exhausted most days and have spent most journeys in a dozy stupor. I could have written about the Arena exhibition at the Menier Gallery. The exhibition looked rather good and drew some favourable reviews online. But I do wonder about whole exercise of group exhibitions without a unifying theme. Another potential post was the RA summer show, which was the focus of a rather manic day in London. Diversity, as one might expect, was the name of the game for this exhibition, which had something for everyone, but a large amount of nothing for most. The photography section was rather mixed. As with a lot of modern photography, size trumps quality and there was a lot of mundane photography printed large that had passed the selection for the show. In the past month Panasonic released an updated version of their 20mm/f1.7 lens, with which I do 90% of my photography. With no changes to either the optics or the AF, they missed an opportunity to improve the close focussing of this lens, so I’m not tempted to upgrade. On the other hand the new GX7 camera does look rather nice and would be my choice if I was buying a new camera. But that day is a long way off. I nearly wrote about the two films in the summer series of BBC’s Imagine programme. One was about the reclusive and only just found Vivian Maier. This was a nice biography and review of her work, but rather strange in that John Maloof, the guy who owns 90% of her archive and the key person in the story of her discovery, did not participate in the film. He is making one of his own, which is out later. Still, it seemed churlish not contribute and spread the word further about her rather wonderful work. The other Imagine programme was McCullin, a film about war photographer Don McCullin. I have only managed to watch half of this documentary; I could not stomach his blood lust. I’ve met and listened to other war photographers, and they all sit somewhere on the spectrum of wanting to bear witness of atrocities to an unknowing world, to that of adrenaline-fuelled junkies who will do anything to get the picture. Half are the latter, who use the witness argument as an excuse. I have a few new books in my library that have taken my attention too. I’ve really enjoyed Robert MacFarlane’s mediation on landscape and paths The Old Ways. I also got Abelardo Morrell’s The Universe Next Door, a catalogue from a recent American exhibition, which shows a good cross section of his photography. I have seen him described as a photographer’s photographer and this is very apt; it is refreshing to see intelligent, attractive and clever photography rather than the weak and dull conceptual photography that seems to be everywhere today. So there have been things to write about, it’s just that I’ve not had the energy or motivation to do it recently. My batteries need recharging, so I’m going to stick myself in the garage on a long trickle charge and not post again until the middle of September. Have a good summer break! There are times when I feel so provincial that it’s easy to forget that I grew up in greater London and the big city is only an hour away by train. On Sunday we travelled up to the open afternoon at the Arena exhibition in the Menier Gallery. The exhibition looked splendid BTW, with most of the members putting out the best of their recent work, and it all looked beautifully curated and hung by Kirsten Cooke. After the show, our family went for lunch at the nearby Borough Market and then on for stroll along the South Bank as a slow way of getting back to Waterloo. There was a nice relaxed vibe as everyone was enjoying the first of summer sunshine and warmth. We go the Tate modern and my son suggested that it might be nice to wander across the Millennium Bridge to look at the city and catch the breeze. It was here that we came across these ‘love padlocks’ that had been shackled to the thin steel hawsers that make up the fence and handrails for the bridge. Although there were many people out with cameras I was the only one who was photographing these love padlocks. I guess I must have appeared like a country bumpkin complete with pitchfork and, smock and straw hat expressing wonder in the completely obvious and banal aspects of city life. I showed these pictures to my daughter a couple of days later, who told me the padlocks on the Millennium Bridge are nothing compared to those on the Pont des Arts in Paris. Yes indeed, search on Google you will see that that bridge is completely encrusted with the things, and in many ways has lost the poetry of the few that are in London. Wikipedia has a page that describes the phenomenon and underscores the fact that I don’t get out and about enough. The padlocks still seem cute to me however, and a more gentle way of lovers leaving their mark on a city without vandalising the place by carving names on wood or spraying graffiti on walls. Looking at the date of the previous post I’m rather embarrassed to notice that it is almost one month since the last post. All the blogging guides stress the need to regularly post to maintain readership, and I’ve fallen well short of my target of at least one post per week. In my defence I’ll say that June is always a busy month in our family with many significant dates to be planned for and celebrated, the allotment is has plants growing like topsy requiring care and nuture, and the kids are keeping me busy with cricket matches and driving lessons. All of which has meant little spare time for photography, and what time I have had has been spent preparing for the Arena exhibition that opens in London today. This exhibition is the largest Arena has held for some time. In the past, the group has been able to hold shows at some prestiguois venues, including the Barbican Gallery and NMPFT. These days it is much more difficult to secure a good gallery in which to show work. The demand for exhibition space has increased at the same time as the supply of suitable venues has dried up. So for the next couple of weeks Arena has taken the bold step of renting a commercial gallery in which to hold a display of our work. After a lot of deliberation we settled on the Menier Gallery, situated on the edge of Borough Market, for its combination of exhibition space and busy (we hope) footfall. My contribution to the Menier exhibition are the four joiners shown here. Framed in two 70X70cm and 80X60cm mounts, these prints are somewhat larger than I normally exhibit and have taken a fair amount of effort to get printed, mounted, framed and packaged ready for the exhibition. These joiners look very good printed large, and I wonder how large I could make them. Since each individual cell could easily be printed to 30X30cm at quality print resolution, I could technically make a joiner bigger than I have wall space for at home. I won’t be able to see the exhibition until this coming weekend, but I am sure that it will be very worthwhile and will look excellent. I must give a big public ‘thank you’ to Kirsten Cooke who has been the driving force behind this exhibition from its conception and has done a wonderful job in organising a disparate group of photographers into producing a good show. If you are in London over the next couple of weeks please take a look at the wide variety of work that is on display. For more information please visit the Arena website. The Arena Summer exhibition is at the Menier Gallery in central London, 10th to 22nd June 2013. Last Sunday morning I was busy doing that most manly of pursuits, that of pottering, when my wife phoned me in the middle of her run to say “you’ve just got to get up to the woods and take some pics of the bluebells”. So I got together my photo gear and put it in the car. I wasn’t sure which lenses to pack so I took all three for the G3. Since I was going to take picture of bluebells, and they are quite small, I packed the extension rings. But I had previous done some nice bluebell pictures with the LX3 which is brilliant at very-close-up-in-context situations, so I packed that too. It was quite sunny when she called, so I packed took my reflectors to help lift the shadows. Now, there were clouds beginning to fill the sky, so it might be cloudy when I get to the woods, in which case the flash kit would be more useful. And if I was going to take the flash kit, I might as well take the flash stands. In the end, I was wandering around the woods with three bags wrapped around my shoulders, but mostly my neck, looking like some deranged photographic sherpa. It was never quite sunny enough to justify the use of the reflectors, never quite dull enough to need the flash. No need to use the flash stands either. It was such a drag lugging the gear around that when I put the bags down to use my camera I didn’t want to get out the other gear. The extension tubes got used for a couple of frames. The zoom lens was unused and the LX3 stayed in its pouch. I didn’t get any decent pictures of bluebells. Next time I'll take a lot less gear and I'll not regret what's left behind.